We had the pleasure of working with not one, but two happy couples that hosted their Wedding Celebrations on Saturday, July 2nd, 2016 at Venuti’s in Addison, IL! Allison Cebry & Tom Agres hosted their Wedding Reception in the Verona Ballroom. The Elegant Event Lighting team designed a beautiful sheer ivory fabric fairy light backdrop that ran along the entire length of the ballroom and framed the bridal party head table. We love how soft glow of the fairy lights created a romantic ambiance in the ballroom for Allison & Tom’s reception! Melissa Montalvo & Ozzie Ornelas celebrated their “I Do’s” with family and friends in the Venezia Ballroom. 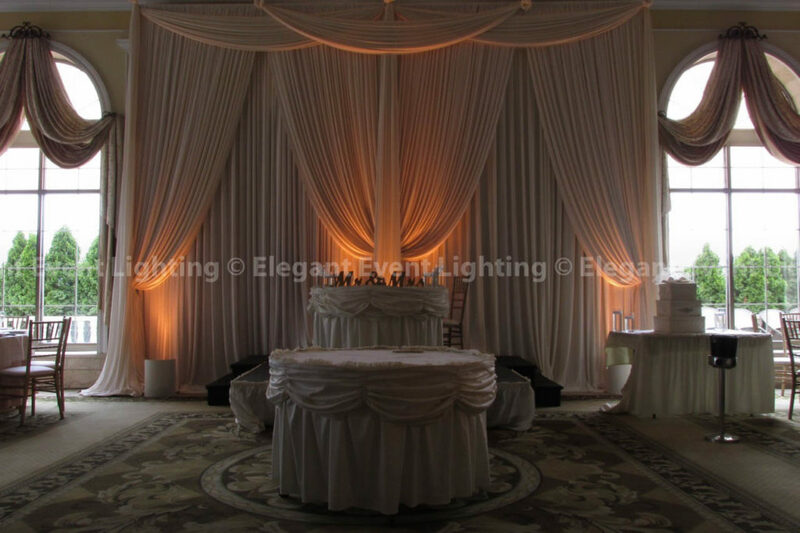 The EEL Chicago Team created a gorgeous ivory fabric backdrop that adorned the couple’s sweetheart table. 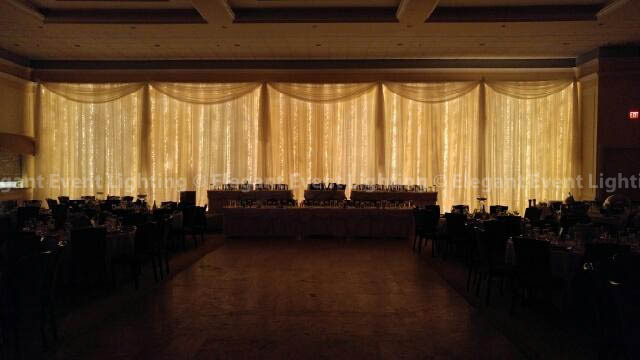 The pleating and valences incorporated in the design were accentuated with soft amber uplighting that illuminated the backdrop and the entire perimeter of the Venezia Ballroom. Allison & Tom and Melissa & Ozzie – thank you again for choosing Elegant Event Lighting to be a part of your special days! Our entire team wishes you nothing but happiness as you begin married life!